Tuataras are among the most evolutionarily distinct creatures in the class Reptilia. Of the four orders of reptiles (Crocodilia, Sphenodontia, Squamata, and Testudines), Sphenodontia (meaning “wedge tooth”), is devoted entirely to the two living species of tuatara, as well as many extinct species. Sphenodonts flourished 200 million years ago and diversified into a wide array of creatures, such as aquatic pleurosaurs. An illustration of Pleurosaurus goldfussi, a sphenodontian from the late Jurassic that lived in what is now Germany and France. Tuataras once flourished throughout New Zealand but are now extinct on the main islands. However, ambitious rat eradication programs have reintroduced tuataras to many remote islands off the coast of New Zealand’s main islands. Tuataras, however, retain the ancient lizard-shaped body plan of tetrapods, though they are only distantly related to squamates, the order of reptiles that includes lizards. They used to be widespread throughout New Zealand; however, their numbers declined with the arrival of Polynesians and then Europeans, who brought cats, dogs, and rats to the islands. Rats in particular have decimated tuataras by eating their eggs, and tuataras can now only live on remote islands off the coast of the main islands of New Zealand. Pronounced parietal eye – Tuataras, like many other chordates, have a parietal eye on the top of their head. Tuataras are distinct, though, in that their “third eye” is relatively well-developed, with a lens and retina. They have, according to Wikipedia, the most pronounced parietal eyes of all extant tetrapods. Their third eyes are only visible as a translucent spot on the top of their heads while they are juveniles; as they mature, pigments and scales cover up the spot. The function of their third eye is unknown; however, it probably plays a role in regulating circadian rhythms and temperature because it is a part of the epithalamus, which controls those processes. It might also manufacture vitamin D.
Primitive hearing organs – Tuataras (along with turtles) lack ear drums and ear holes, and their middle ear cavity, which in most amniotes (reptiles, birds, and mammals) is filled with fluid, is instead full of adipose (fatty) tissue. They also have primitive middle ear bones and unspecialized hair cells in their inner ear. Because of the simple construction of their ears, they can only hear frequencies from 100-800 Hz, compared to a range of 20Hz to 20,000Hz (20kHz) for humans. 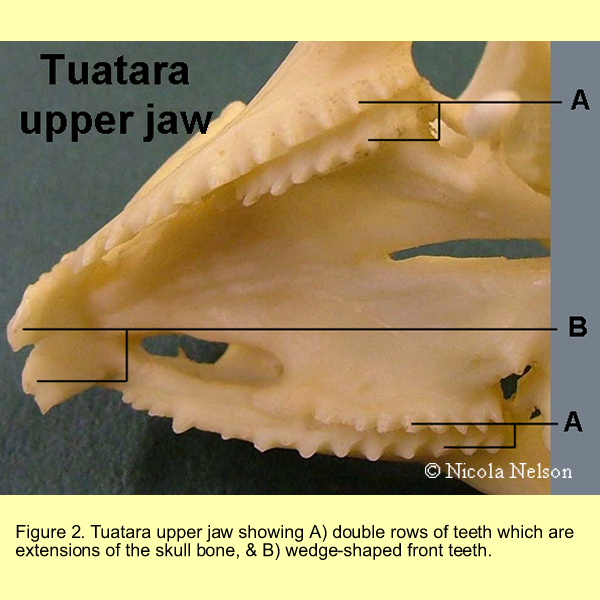 Funky teeth – Tuataras have two rows of teeth on their upper jaw and one row of teeth on their bottom jaw. The teeth on the bottom jaw fit in between the two upper rows of teeth, allowing tuataras to slice their prey with their teeth. This dental configuration is unique among reptiles; snakes also have two rows of teeth on their upper jaw, but they use them for different purposes. Judging by the information online, the teeth are often said to be extensions of the jaw bone rather than actual teeth. However, Marc Jones informed me in the comments that tuatara teeth are, indeed, real teeth. However, they are fused to the jaw bone and their enamel is very thin. The teeth wear down as the tuatara ages until only smooth jaw bone is left, so old tuataras stick mostly to soft food like worms and grubs. Tuatara teeth form serations on the jaws. A row of teeth on the bottom jaw fits between the two rows on the upper jaw. The skull also has a beak-like projection on the front part of the upper jaw. Ribs – Tuataras are the only tetrapods (a term that includes amphibians, reptiles, mammals, and birds) with well-developed gastralia and uncinate processes. Gastralia are rib-like bones that form a cage on the underside of the abdomen, though they are not actually attached to the spine or ribs. They give tuataras a hard underbelly. The ribs of tuataras are short and have small, hooked projections called uncinate processes, which are present in a less-developed form in birds. Tuataras have abdominal ribs, called gastralia, that gird their underside. They also have pronounced uncinate processes. Vertebrae – Tuatara have hourglass shaped (amphicoelous) vertebrae. Though this shape is typical for fish and amphibians, the tuatara is the only amniote (a term that encompasses reptiles, mammals, and birds) known to have such vertebrae. Eyes – Though not unique to tuataras, their eyes can focus independently and have “duplex retinas” that contain two types of visual cells for day and night vision. Like many other amniotes, they also have a tapetum lucidum, which is a reflective membrane at the back of the eye that enhances night vision, and they have three eyelids – a top one, a bottom one, and a nictitating membrane, which is a clear membrane that moistens and protects the eye while also allowing sight. Skull– Tuataras arguably have the most primitive skulls of all the amniotes (turtle skulls might be more primitive), with many of the original amniote features preserved. Most notably, they have two large openings, the temporal fenestrae (meaning “side windows” in Latin), on each side of their skulls [although, as Marc informs me, “The lower temporal bar which forms the lower boundary of the lower temporal fenestra has been secondarily acquired.” So the temporal fenestrae are not inherited directly from primitive amniotes, although they are still a somewhat unique feature of the tuatara]. 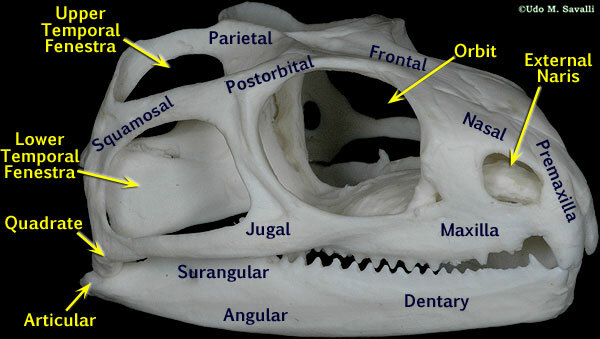 The two large temporal fenestrae on each side of the skull are the most notable primitive features of the tuatara skull. In the News: You may have heard recently of Henry, a 111-year-old tuatara. For decades Henry was grumpy and aggressive, showing no interest in mating and attacking nearby tuataras. However, in 2002, veterinarians recognized and removed a tumor on Henry’s testicles, and by 2008 he had fertilized Mildred, another tuatara who is probably between 70-80 years old. In a boon to the Southland Museum’s tuatara breeding program, she laid 12 eggs, 11 of which hatched. More Information: I have to admit that I owe a lot (almost everything) on this page to the tuatara Wikipedia article. However, the Wikipedia article draws on a ton of erudite sources for its information, which probably explains why it is so in-depth and technical. So in this case, ironically, Wikipedia is a much more dependable source of information than most of the stuff out there on the web.